I'm at a loss on how to quilt this pinwheel quilt. I don't do FMQ so that leaves straight lines or serpentine stitches. I don't really want to do SITD or echo the pinwheels either. I do have an emb machine I could use to quilt but that would entail finding a design the would fix the blocks. I just need something simple and uncomplicated that would look nice. It's a charity quilt not an heirloom quilt. I don't have the borders on yet but pinned one on one side. I'm going to use the rust color for a border. 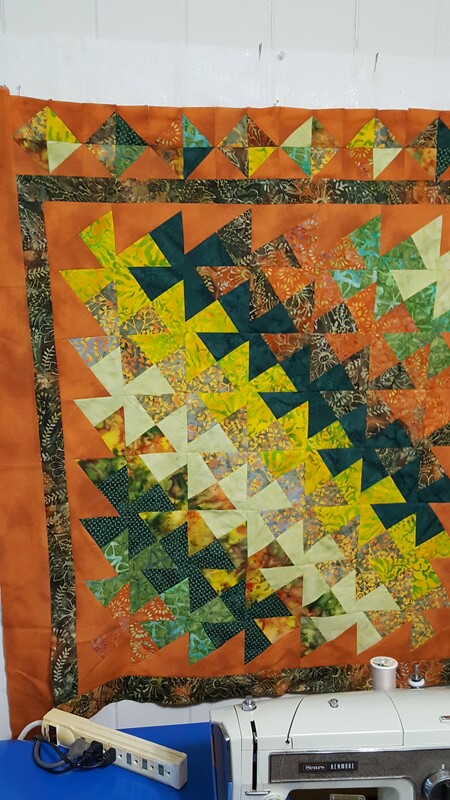 I'm thinking about adding another thin green batik border on the top to break up the rust between the blocks and the border. Any suggestions?? A cross Hatch pattern might be nice. That dark green in a 1" border before the rust goes on would help. I ditto the cross hatching idea! I would suggest some dot to dot quilting. Check You Tube videos for lots of ideas. Angela Walters has info on this design as well. You could do curves inward from each point of the pinwheel shapes, same idea in the framing squares, and half feathers in the frame? You might also like putting 4 large tear drop shapes in the pinwheels, maybe? Agreed. A cross hatch done on the diagonal or horizontal/vertical works. But I think this would be a perfect opportunity to spread your wings and try FMQ. The picture appears the quilt isn't very big and it really is very easy to do FMQ in a meander type pattern. Let this quilt be your opportunity to give it a shot. I am sure, if it is for charity, the recipient won't mind one bit if you have a few wobbles here and there and your stitch length varies a bit. Since they’re pinwheels why not do waves of wind. Maggie Lou, I love your quilt! I like the idea of a thin green as well. Not much help about quilting as machine quilting is still new for me. Have you thought of big stitch? Just throwing it out there as I'm thinking of trying it on one of mine. I would use curves of some sort since the quilt is angular. You can do all sorts of curves with a walking foot. I have made flowers, hearts and such with a walking foot. You do have to be careful not to make the curve too tight. There are times that you will have to stop with the needle down and pivot a bit but that's not a big deal for me. If you go from the center point of each pinwheel you could do a shape like a tear drop/flower petal. Start in the center and you'll end up back in the center at the end so a continuous quilting. You will have to turn your quilt so if it is a large one and your machine has a narrow throat/harp area it might not be possible to do much turning but I don't make king size quilts so never had much of a problem with turning.